NEW JERSEY -- Oh deer! 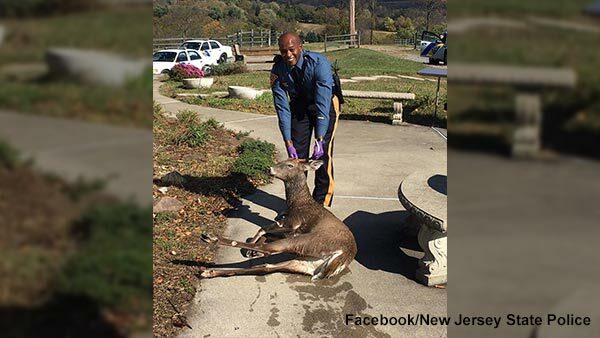 A New Jersey State Police Trooper is being commended with rescuing a deer that nearly drowned in a swimming pool. Police say Trooper Dwayne Phillips was called to a home in Harmony Township around 12:40 p.m. Friday when he noticed the buck struggling to get out of the pool. That's when Trooper Phillips sprang into action. According to police, the trooper grabbed the deer by its antlers and pulled it out of the water to safety. After regaining enough energy, the deer stood and ran off. "Now believe it or not, we don't necessarily teach recruits in the academy how to rescue drowning deer, but we do teach them how to think on their feet and adapt and improvise when a peculiar situation presents itself," the NJSP said in a Facebook post. Police say Trooper Philips did a great job. "The most rewarding thing that we can do as troopers is to save a life, human or animal. And this past Friday, that's just what Trooper Dwayne Phillips did!," the NJSP said.